Following a world premiere as one of the opening night selections of the Sundance Film Festival in January, conceptual visual artist Rashid Johnson’s adaptation of Richard Wright’s venerable “Native Son” debuts April 6 on HBO. The third big screen version of the story of Bigger Thomas, Wright’s film retains many of the book’s central plot points and its ideological critique of institutional racism. The screenplay, by Pulitzer-winner Suzan-Lori Parks, updates sparingly and, for the most part, efficiently. Only committed devotees of the literature will notice the significant alterations, the most prominent of which revolves around the fate of the character Bessie and the resolution of the drama. Johnson’s movie, despite several shortcomings, is well worth a look. 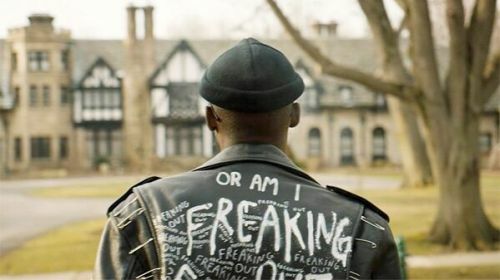 Ashton Sanders, memorable as both the teenage Chiron in 2016’s “Moonlight” and opposite Denzel Washington in last year’s “The Equalizer 2,” makes an excellent Bigger Thomas (called Big this time out). Enveloped in several stylized trappings of artistically-inclined hipsterism -- including fingernail polish, green hair, Malcolm X-evoking eyeglasses, and a safety-pinned leather motorcycle jacket decorated with a painted “Freaking Out” motif ala classic punk rock -- Big’s got smarts of both the book and street varieties. Working as a bike messenger but living in less-than-ideal conditions with his family, Big accepts a “golden” opportunity to become the live-in chauffeur for rich white man Henry Dalton (Bill Camp, never better). All too quickly Big realizes that his principal responsibilities entail driving Dalton’s manipulative daughter Mary (Margaret Qualley) wherever she wishes to go, which more often than not fails to correspond to Mr. Dalton’s assumptions regarding her activities. Mary’s companion Jan (Nick Robinson), a social activist who, like Mary, is oblivious to his own privilege, rides along. For those unfamiliar with the classic 1940 novel, an almost surreal and certainly absurd tragedy marks the turning point of the narrative. Johnson handles it with the necessary horror, balancing on Wright’s carefully constructed tightrope that supports the weight of not one, but two victims. Arguably, the scenes in which Big navigates the white world of the Daltons ring out with the most punch, especially in terms of dialogue and performance. The pressure on Big to perform multiple roles, dependent on the shifting contexts in which he operates, brings code-switching into the equation in a way that allows the filmmakers to explore the most contemporary aspects of Wright’s ideas (along with, of course, the unchanged realities of two Americas). Whether or not Johnson overcomes the arguments made by James Baldwin in essays contained within “Notes of a Native Son” rests largely with the viewer’s sympathies with the objectives and sensibilities of Wright (and Johnson). As tech credits go, first-time feature helmer Johnson’s not-so-secret weapon is the presence of ace cinematographer Matthew Libatique, who also serves as one of the film’s producers. Johnson’s striking vision is enhanced by Libatique’s photography, which perfectly outlines the discomfort experienced by Big as he tries -- and fails -- to fit in anywhere. The vivid images, which capture the ironic juxtapositions of beautiful graffiti in economically depressed neighborhoods as well as the weight of seeing the work of celebrated contemporary African American painters decorating the walls of the Dalton mansion, mirror Big’s pain and his struggle to deal with the liminal state between his own sense of self and the version of it acted out for others.